Even if it’s a little crazier, it’s definitely a lot more fun when the kids get to take part! Since Elijah was about two or three, one of our summer traditions has been to help my parents harvest the cherries from their row of cherry trees. We’ve spent a day or two each June picking cherries, and the boys love that they can reach some of the cherries and help Grandma and Grandpa. 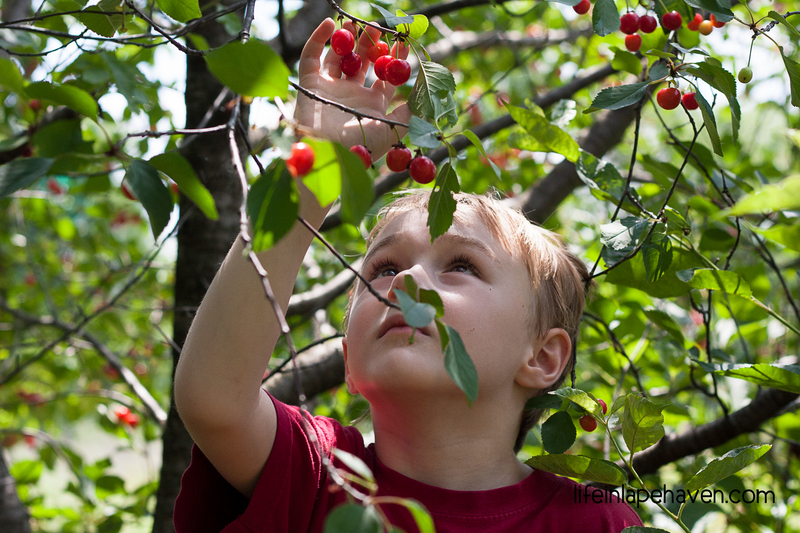 They have a wonderful time getting their hands sticky as they fill their buckets and wander from tree to tree, picking a few cherries from each one. Each boy tries to get more cherries than his brother, although Josiah tends to get tired of picking cherries sooner than Elijah is. Last year’s picking was especially memorable because it was a very bountiful year, plus on one of the days we went over, we were there the same time as two of Elijah and Josiah’s cousins, so the four boys helped to gather quite a few cherries (when they weren’t chasing each other around the trees)! 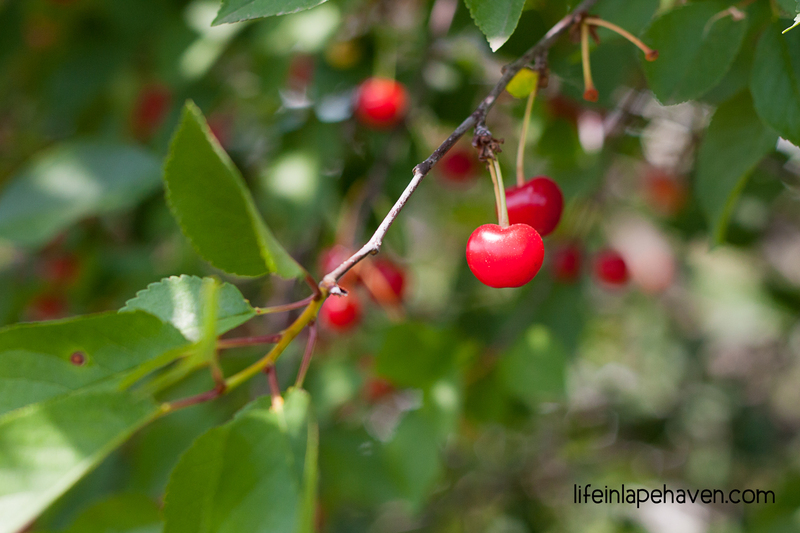 We ended up with so many cherries that I think I might still have some in the freezer! This year’s harvest was definitely less impressive, but our family still managed to come away with enough cherries to make something yummy. My sweet mom even pitted them for us (me) before we left their house. My first step when I have fresh cherries is either to go ahead and freeze them or to make homemade cherry pie filling. 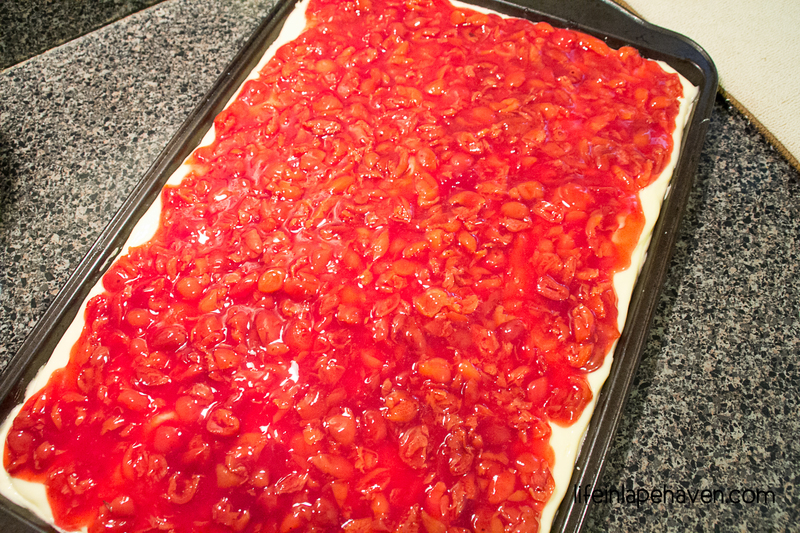 I have found a really tasty recipe for cherry pie filling over at Crumbs and Chaos. 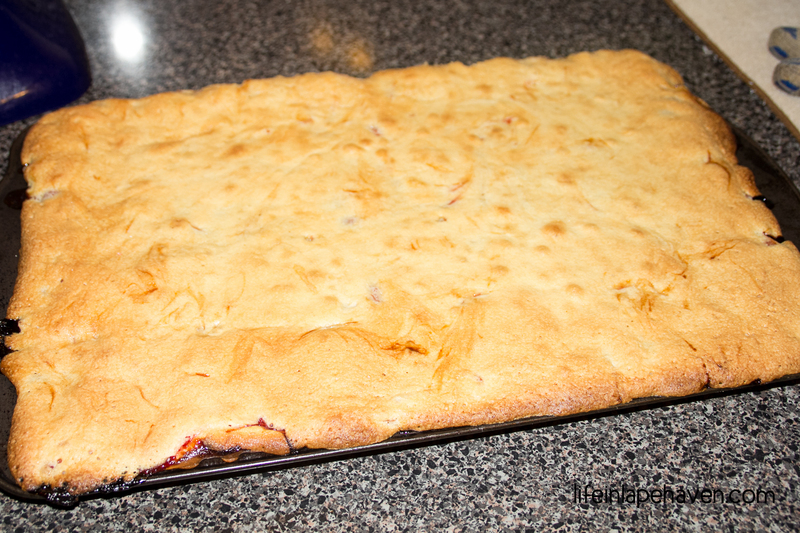 Since I’m not a huge cherry pie fan, I wanted to find a new recipe to use our cherries in. My parents’ cherry trees produce sour cherries, so I knew it had to be something with enough sweetness to balance the tartness. I thought about making hand pies with the cherry filling, but then I remembered a cherry pie bar I made last year with some of our bounty. However, this year I couldn’t find the recipe that I used. Instead I came across another one that I had saved a while ago, one that adds a cream cheese layer to the bars. 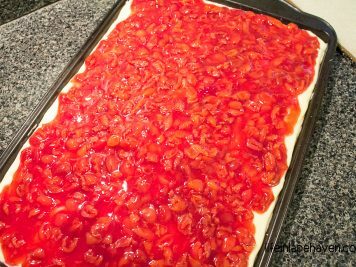 I don’t think I’ll even need to worry about that other cherry pie bar recipe. 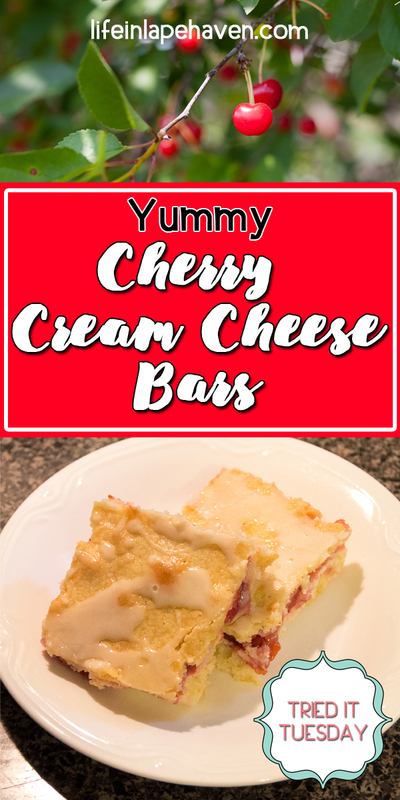 These Cherry Cream Cheese Bars by Inspired by Charm are delicious. 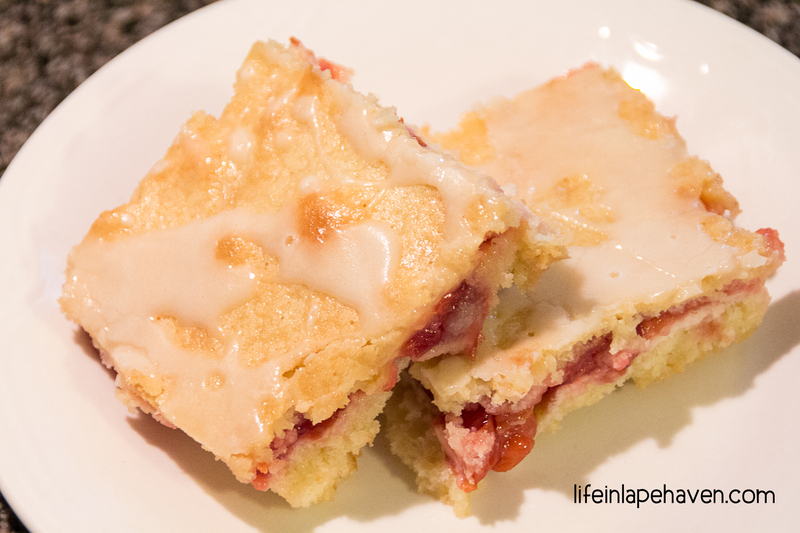 The cream cheese and the almond extract really set these cherry bars apart. While they are a little involved, with all the layering you have to do, they are worth it! 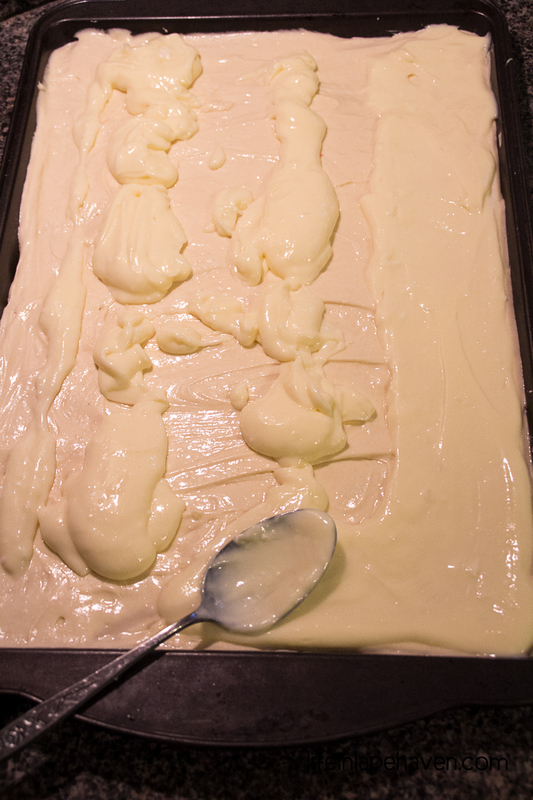 Spread out some of the batter. Top the batter with a cream cheese layer. Next comes the homemade cherry pie filling. Top it all with the rest of the batter. Bake to golden brown and drizzle with glaze. Slice and serve. Great with vanilla ice cream! They were great while they were still slightly warm (though kind of messy to cut), and they were really yummy once they were cooled completely, but they are perfect when topped with some vanilla ice cream. I took them to our family reunion over the weekend, and everyone else loved them as much as we did. I’m pretty certain you will, too. 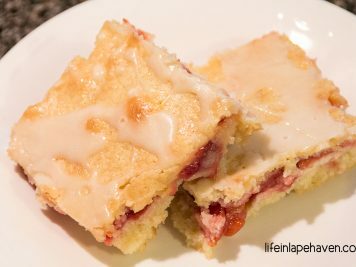 Here’s how I made these Yummy Cherry Cream Cheese Bars. 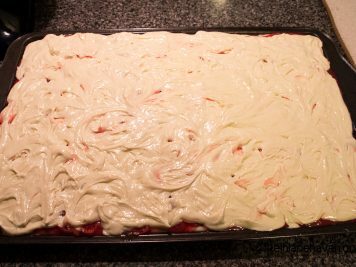 Homemade cherry pie filling plus a smooth cream cheese layer combine to make a delicious bar, perfect on its own or a la mode. 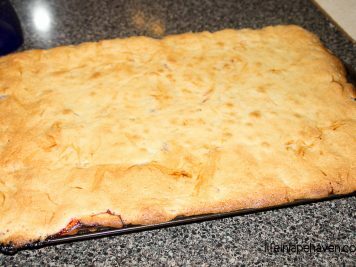 Grease a 15x10x1-inch baking sheet. Cream together butter, sugar, and salt until light and fluffy. Add eggs one at a time, beating well after each one. Mix in vanilla and almond extracts. Combine flour and baking powder in small bowl. 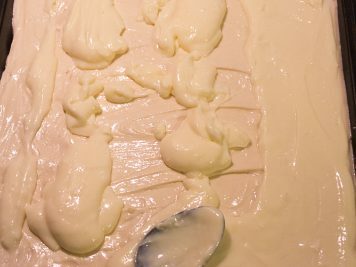 Add flour mixture into butter mixture gradually, about one cup at a time, mixing after each addition. In a small mixing bowl, beat together softened cream cheese, sugar, and egg until smooth and creamy. 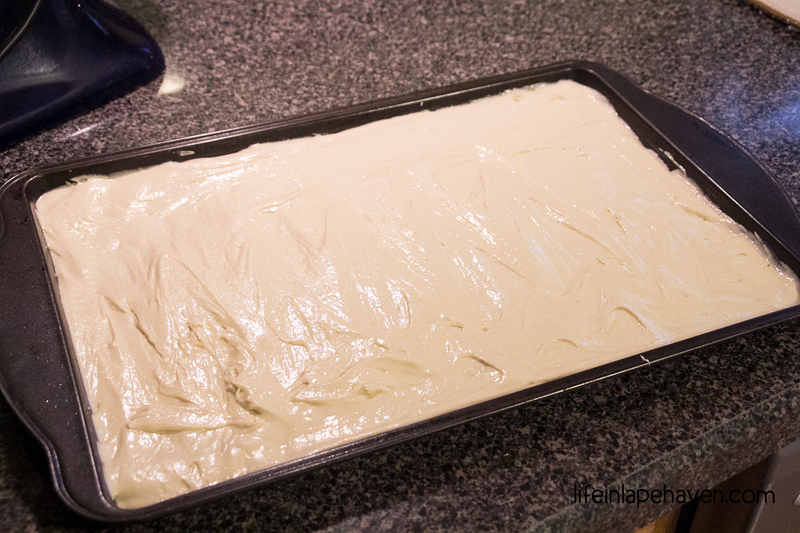 Add the cream cheese layer on top of the batter layer in the pan. 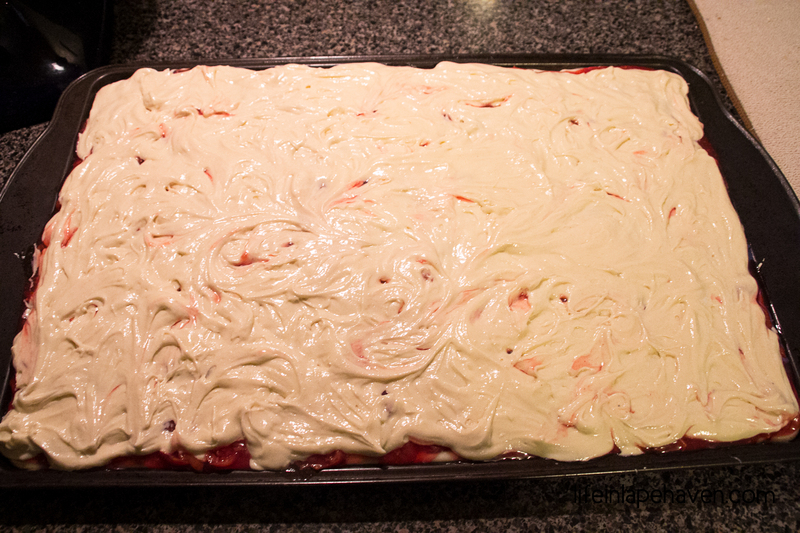 Carefully spread the cherry pie filling as your next layer, on top of the cream cheese. Bake for 35-40 minutes, or until top layer is golden brown. While bars cool, combine powdered sugar and vanilla and almond extracts. Slowly add the cream and milk until the right consistency is reached for the glaze. Drizzle glaze over the cooled cherry bars. *Note: When I made these, my batter overflowed the pan in the oven, even though it was the correctly sized pan. Keep an eye on them when you first put them in. 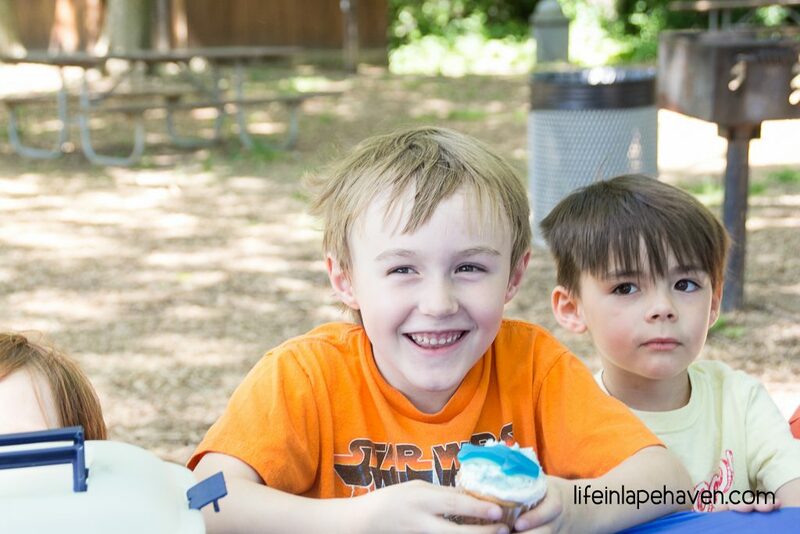 This year for his birthday, Elijah wanted to have his party at our local state park because he wanted to go fishing as part of his day. 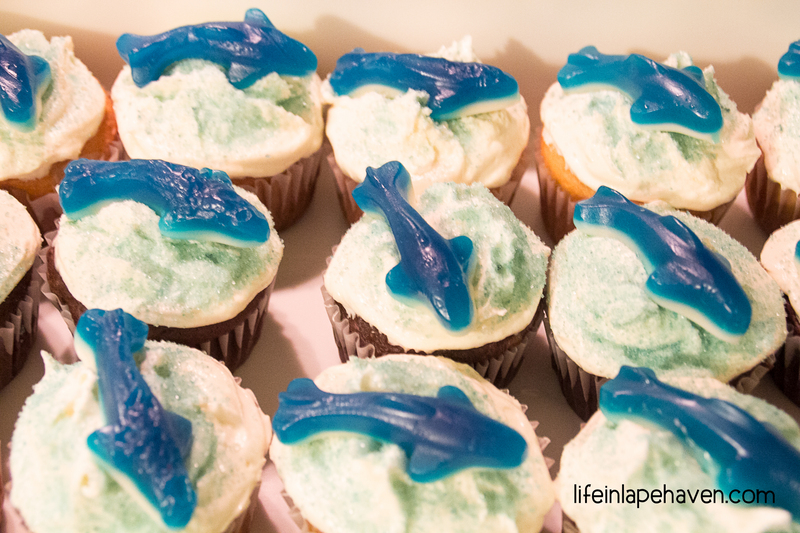 With Elijah’s birthday party being outside at the park, our party food had to be easy and portable, especially knowing that all the kids would be distracted by the nearby playground and fishing dock. Plus the party was in the mid-afternoon, so lots of food just wasn’t necessary. As a result, we went with really simple fare with a bit of a fishing and water theme: cupcakes (decorated with blue shark gummies in “water” frosting), whale crackers, and watermelon. Doing cupcakes instead of a large cake was a given, but frosting is a tricky thing with hot temperatures. 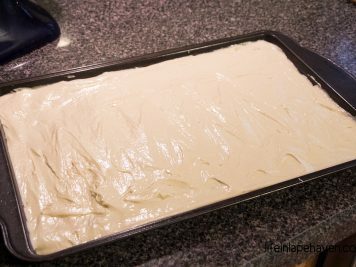 I was hesitant to use a buttercream, but after a different frosting recipe totally flopped for me (I plan to try it again sometime, though, so stay tuned), I decided we could make a buttercream icing work. I researched some recipes before I made the frosting because I wanted for-sure proportions for the icing rather than just tossing some butter, powdered sugar, vanilla, and a splash of milk into my mixer like I usually do. The recipe I chose was titled, “The Best Vanilla Buttercream,” and I have to agree with them on that. 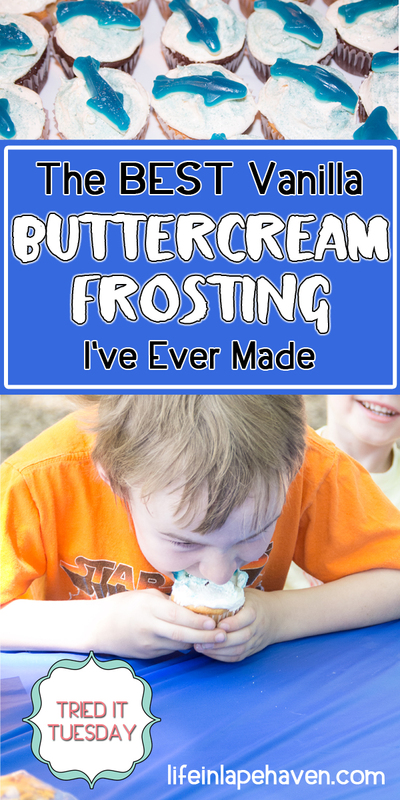 It IS the best vanilla buttercream I’ve ever used. I made a double batch since I had 48 cupcakes to cover, but I probably would have had enough from a single batch since I’m apparently not a heavy froster. However, there really is nothing wrong with having extra buttercream left over. It should freeze well enough, and I know we won’t let it go to waste. While I tend to tweak every recipe I try, this one I followed pretty much exactly. I did, however, use a little heavy cream as part of the milk, just because it seems to make icing a little bit fluffier and yummier. In mixer, beat butter until light and fluffy. Slowly add powdered sugar, mixing in one cup at a time. Add vanilla, milk, and cream. Beat together until thoroughly combined and fluffy. When Brad and I were first married, our church had a picnic once a month in the summertime, which meant that as a newlywed who was still building her recipe repertoire, at first, I didn’t have a lot of ideas for what to take each time. After all, there’s a bit of a difference between cooking for two and cooking for a crowd. 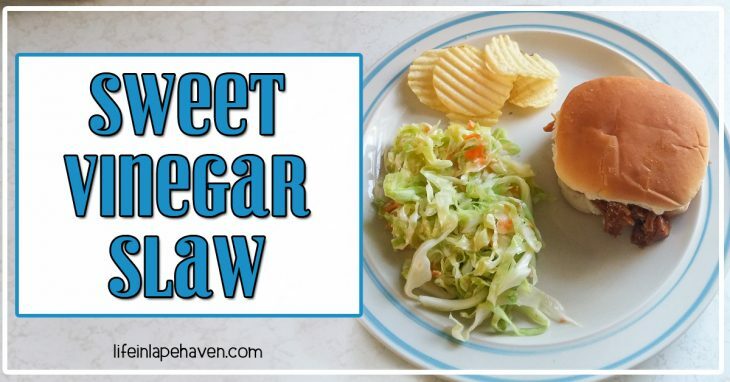 After a couple of summers of taking things like fresh fruit salads, cookies, or random recipes, I was inspired by a side dish at a new local barbecue place, a side dish that I loved and knew I could recreate or at least get pretty close to: Sweet Vinegar Slaw. I’ve never been the biggest fan of traditional coleslaw. I mean, it’s okay with your bucket of fried chicken and all, but I could take it or leave it. However, when I first tasted this vinegar-based slaw at the barbecue restaurant, I was hooked. 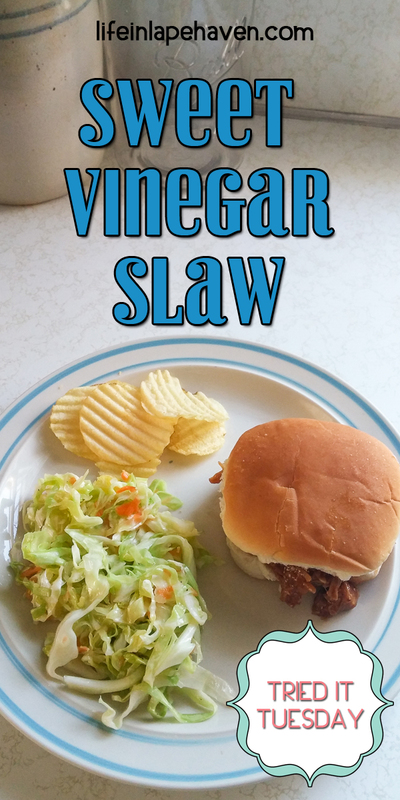 It wasn’t like the creamy, mayonnaise-y taste of regular coleslaw, but rather a sweet, sour, tangy, crunchy yumminess that is especially awesome with barbecue ANYTHING. 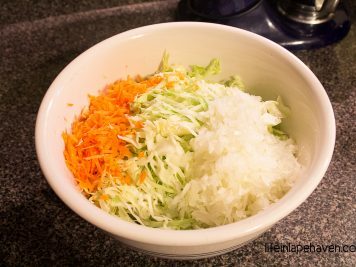 Thinly chop cabbage, onion, and grate carrot. Place in a LARGE bowl with room to mix. Sprinkle sugar over and mix thoroughly. So, I went home, hit up Google, and found several recipes that seemed to mimic the slaw I’d had. I honestly don’t remember where I came across the recipe that I finally made (and I tried looking it up), but it’s been written in my little recipe journal for several years. It’s a definite go-to recipe, especially in the summer. 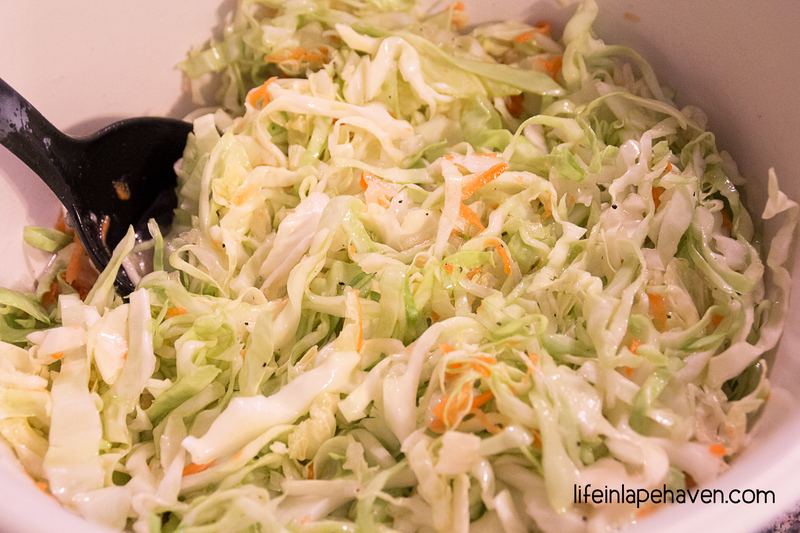 From the first time I made it to every time since, this slaw has been a hit. It’s great for potlucks, picnics, and family gatherings, and unlike creamy coleslaws, you don’t have to worry too much about this in the summer heat. The vinegar and sugar won’t spoil as easily as mayonnaise. Plus, this recipe goes a long way. 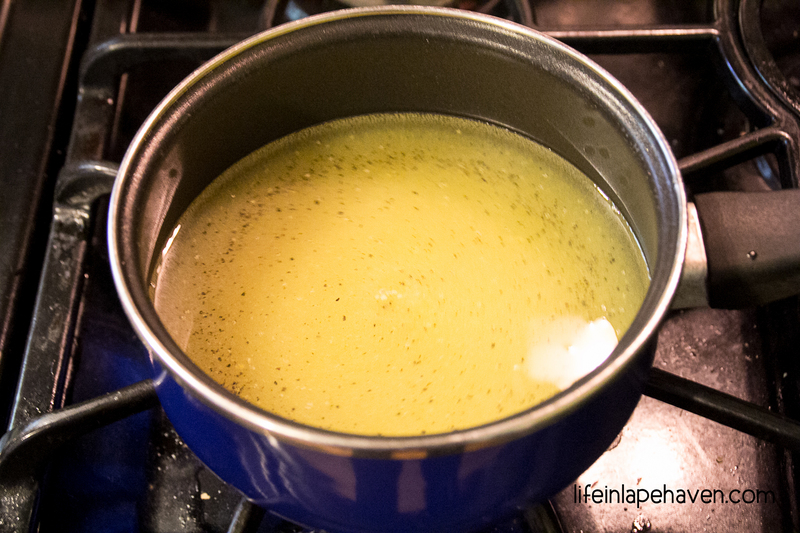 Boil dressing, then allow to cool completely. 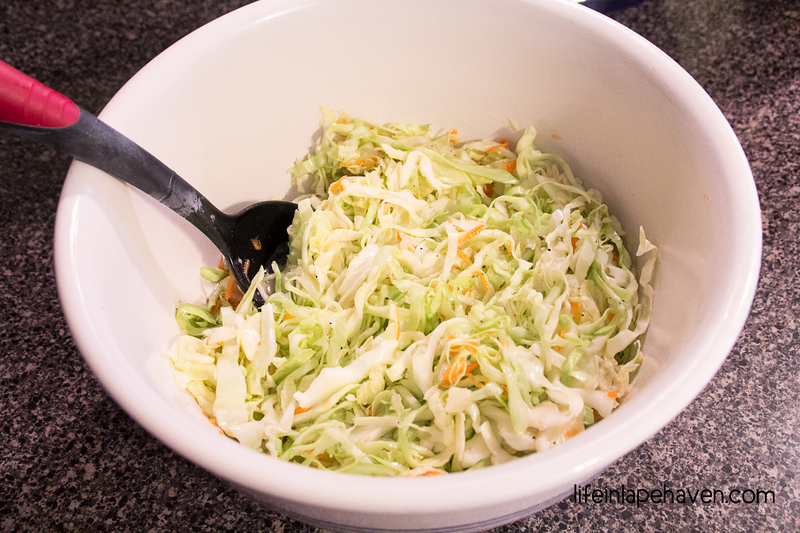 Toss slaw in dressing and refrigerate. 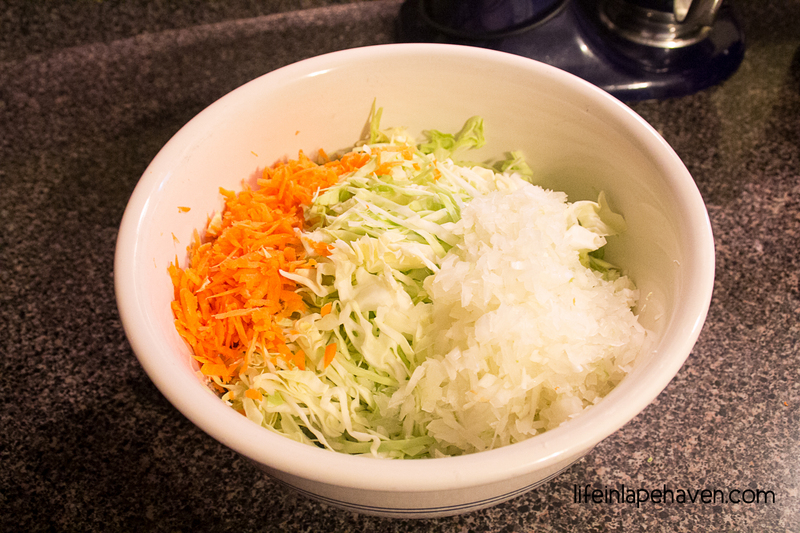 So, to get your summer started off right, here’s how I make Sweet Vinegar Slaw. Enjoy! 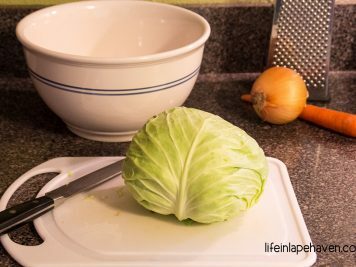 Clean and core cabbage, and then slice it into thin strips. Finely slice and dice your sweet onion. While you could use another onion variety, the Vidalia Sweet Onion adds to the “Sweet” of the “Sweet Vinegar Slaw.” Also, having lived in Glennville, Georgia for a few years, the largest producers of Vidalia Sweet Onions, I’m kind of a fan. 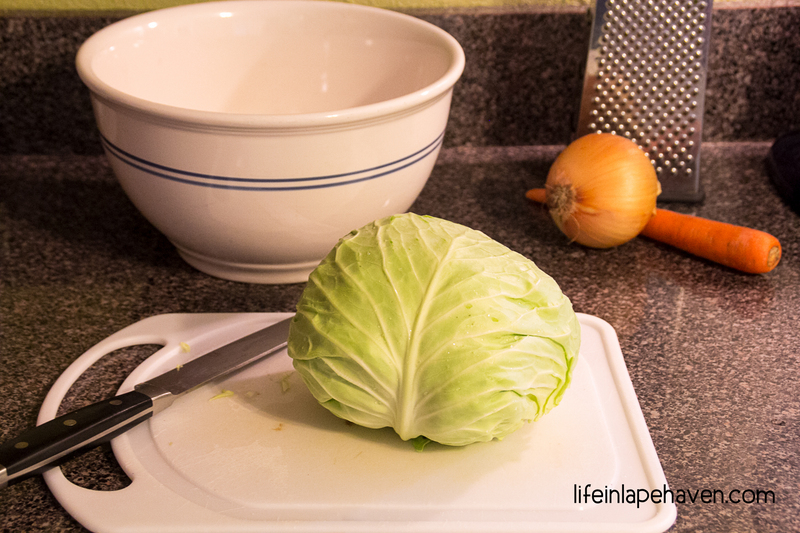 Put your cabbage, onion, and a peeled and grated carrot into a large bowl. 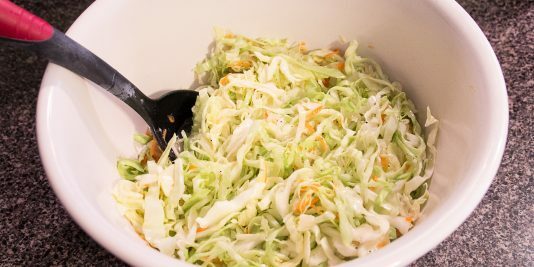 You need a bowl that will be large enough to allow room for mixing and tossing the slaw. 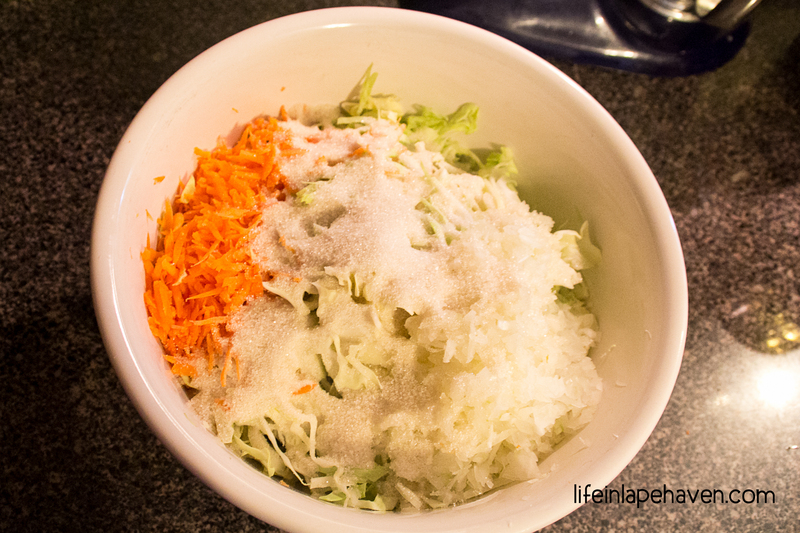 Sprinkle the 1 cup of sugar over your slaw mixture. Stir to combine, and then set aside while you prep the dressing. 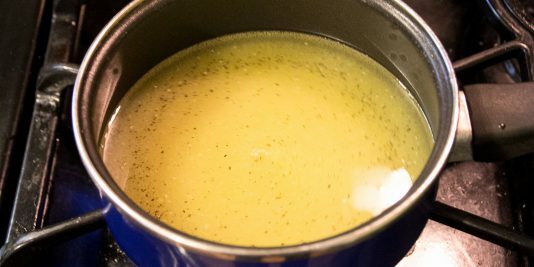 Combine all of the dressing ingredients into a small saucepan and whisk together. Bring to boil over med-high heat, stirring occasionally. Boil for 3 minutes, stirring occasionally. *WARNING: Keep your face back away from the boiling dressing. Hot vinegar in the air isn’t pleasant, as it can burn your eyes or affect your breathing. Also, you are boiling oil, which can spit and pop out of the pan. Be careful. Remove the dressing from the heat to cool it completely. I transfer it to a metal bowl that is placed over an ice bath and whisk it until the dressing is cold (just takes a couple of minutes). 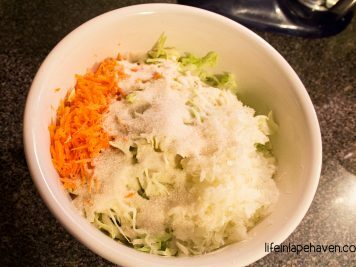 You do not want to add warm or hot dressing to your slaw mixture. It’ll make it wilty. Pour cooled dressing over the slaw and mix thoroughly. Refrigerate. Ideally you would prepare this ahead of time and refrigerate it overnight before serving. However, I have made it the same day and refrigerated the slaw for only a few hours, and it still tastes great. The longer the slaw sets, the liquidier it will become. Use a slotted spoon when serving. Get more ideas, recipes, & encouragement from this real-life mom as I experience God’s faithfulness through the joy and chaos of motherhood. In the winter time, I have it fairly easy because I can make soups and chili that last us at least two or three days. I can divide them up, too, and freeze them so we aren’t literally eating them for three days in a row. 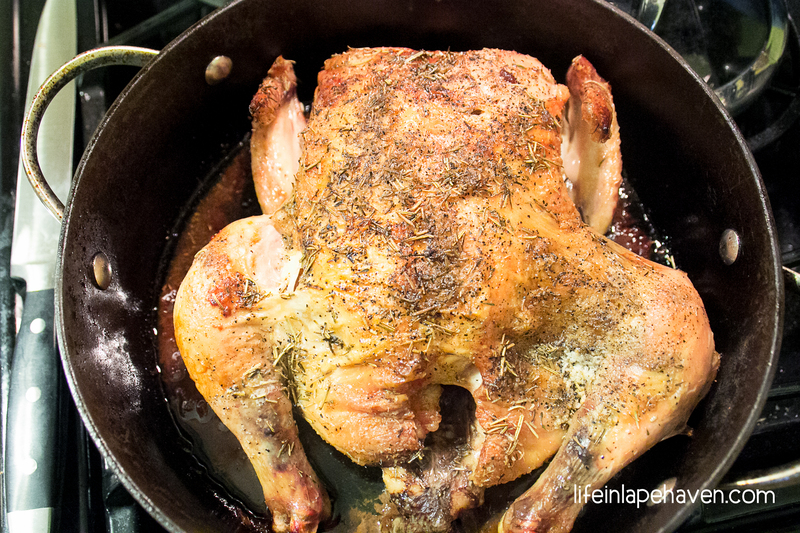 Warmer months are a little trickier, but I have found one thing that is versatile enough that I can stretch it out for several meals in either summer or winter: a whole chicken. Whether we eat it just as it was cooked, or I debone it and use the meat to make chicken pot pie, barbecue chicken sandwiches, chicken tacos, or any number of chicken dishes, it feeds us well for a few days. I used to cook it on the stove top, like my mom always did, bringing it to a boil and then cooking it low and slow all morning, and I still do it like this when I want a bit more stock for my dish, such as chicken and dumplings or chicken and noodles. 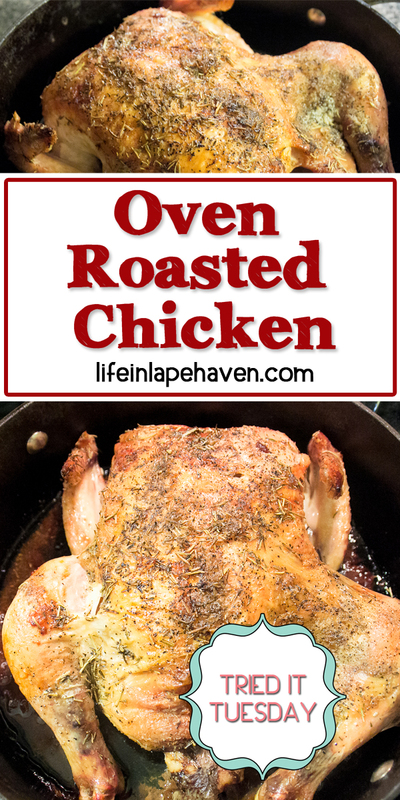 However, my favorite way to cook a chicken now is to oven roast it because it produces a more flavorful, moist meat, and the best method/recipe that I’ve found was one that I came across last year sometime, where they cooked it at 450 degrees – THE WHOLE TIME. (Most oven-roasted chicken directions say to heat your oven to 350). I know you could easily pick up a rotisserie chicken at the grocery store deli, but honestly, it’s sooo easy to roast your own, with your own seasonings, that I would only buy one in a pinch. Lisa at My Own Sweet Thyme has a yummy sounding recipe for Herb Roasted Chicken, which is where I got my cooking directions. I haven’t actually tried her recipe as a whole, though. Even though I don’t always have the exact same measurements on my ingredients, it always comes out delicious with crispy skin and juicy, flavorful chicken. Add about a tablespoon of olive oil to your roasting pan, and swirl the pan to coat the bottom. Remove chicken from packaging, and rinse slightly, removing that fun package of “extras” from inside the chicken cavity. You can either cook those extras separately, toss them in the roasting pan with the chicken (they may overcook), use them to make chicken stock, or throw them away. Pat the rinsed chicken dry with paper towels. In a small bowl or cup, combine your salt, pepper, thyme, and rosemary. Sprinkle your seasoning over the top of the chicken. You can put it under the skin or inside the cavity, too, if you’d like. Lightly drizzle olive oil over the top of the chicken (maybe about a tablespoon or less). Place roasting pan into the oven, uncovered, and roast chicken for about an hour, or until it is cooked to at least 165 when you test the thickest, densest part of the chicken (the area between the breast, leg, and thigh). Remove the pan from the oven, and let the meat rest for 10-15 minutes before carving. You can tent the chicken with foil while it rests to keep in some of the moisture. Every mom needs a go-to on those days when her child is, or children are, being extra picky about eating. Personally, I never really had to worry much with Elijah. He’s always been a good eater. He loves his veggies and fruits, and he’ll try pretty much anything. He may not like it, but he’ll try it. Josiah…not so much. While he’s not horrible, he has his moments. He’ll like something one time and eat it up, then decide when I make it again, that no, he doesn’t like that at all. However, I have a recipe for something that no one in our house ever turns down, not even Josiah. 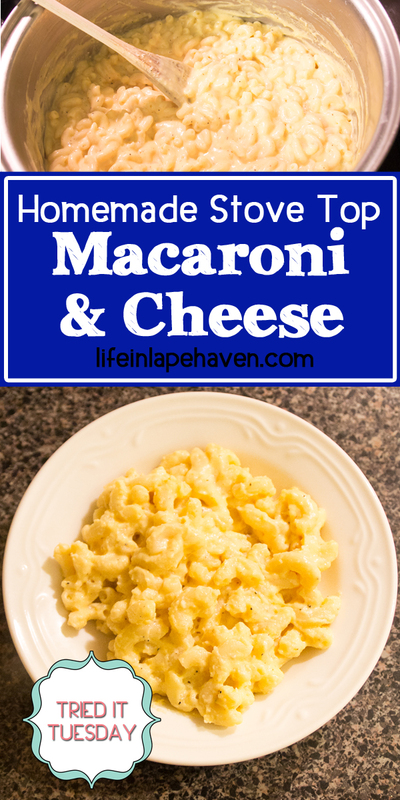 But then again, who doesn’t love homemade stove top macaroni and cheese? It only takes a few ingredients to make from scratch. 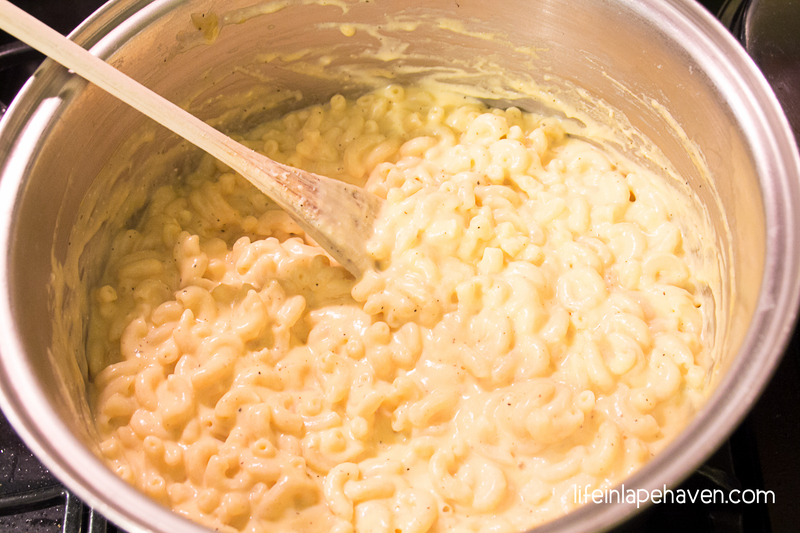 Smooth & creamy mac and cheese! This is one of my boys’ favorites. 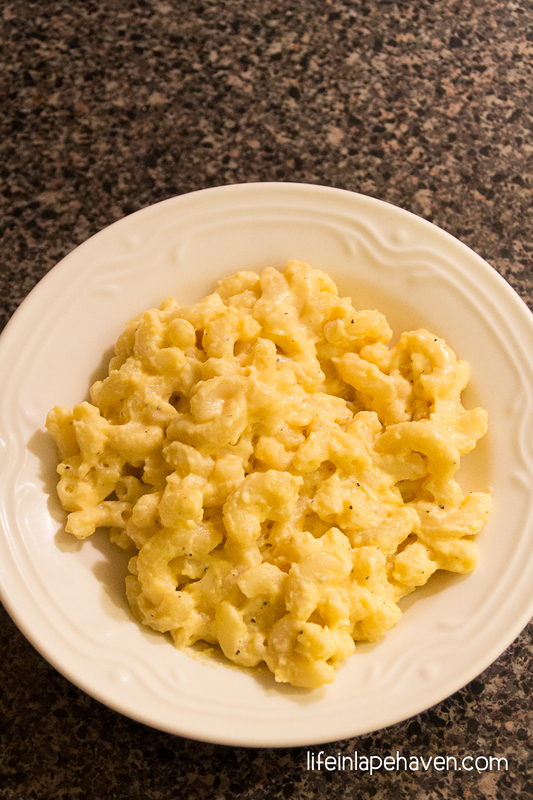 Around here, I’ve been making this super easy recipe for about 3 years, ever since I first saw Alton Brown make this mac and cheese on his stove on a rerun of Good Eats (We love that show!). 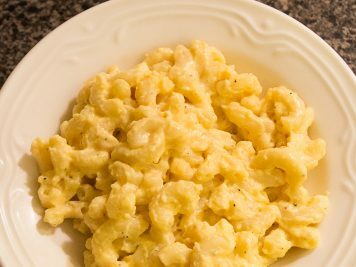 Up to that point, macaroni and cheese was a rare dish in our meals because I just didn’t want to buy it (the orange powder just kind of …uhhh). 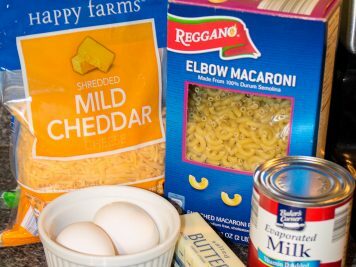 However, seeing how quickly I could make REAL mac and cheese from scratch – just about the same amount of time it takes to make it from the box – I was sold. Made with a handful of ingredients that I generally have on hand all the time, this recipe also makes enough that I usually have some left over for another meal, such as lunch for Josiah and me. So, I’m saving time, money, and feeding my family a little bit healthier (it’s still pasta with butter & lots of cheese, so…). 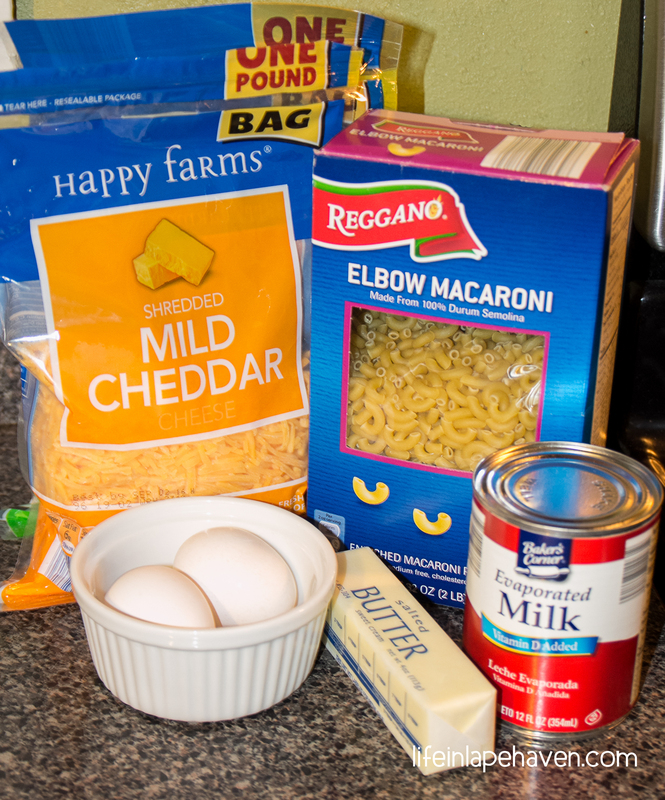 Here is how I make homemade macaroni and cheese on the stove top. This is one of my boys' favorites. 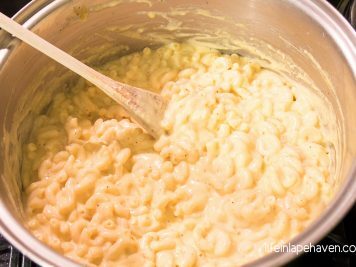 In large pot, bring salted water to boil, and add macaroni, cooking for about 9 minutes. Since you will be heating it with the sauce later, you don’t want to overcook the noodles. While the pasta cooks, in a small bowl, whisk together your salt, pepper, and mustard powder. Add the eggs and evaporated milk to your seasoning & whisk thoroughly. (I have found it’s easier to get the seasoning incorporated when you start with it rather than add it to the eggs & milk later). Set aside. Drain the macaroni, and then return it to the large pot. Add the butter to the pasta, and stir until melted. Stir in your egg mixture. Stir to combine, and then cook on low for about 3 minutes or so, stirring regularly, until it is all smooth and creamy. Earlier this year, I was looking for something new to make for dinner. Tired of the usual standbys, I went searching for inspiration on Pinterest, and I came across a fairly easy-looking recipe for which I had enough of the ingredients in my pantry or refrigerator that I could try it out. 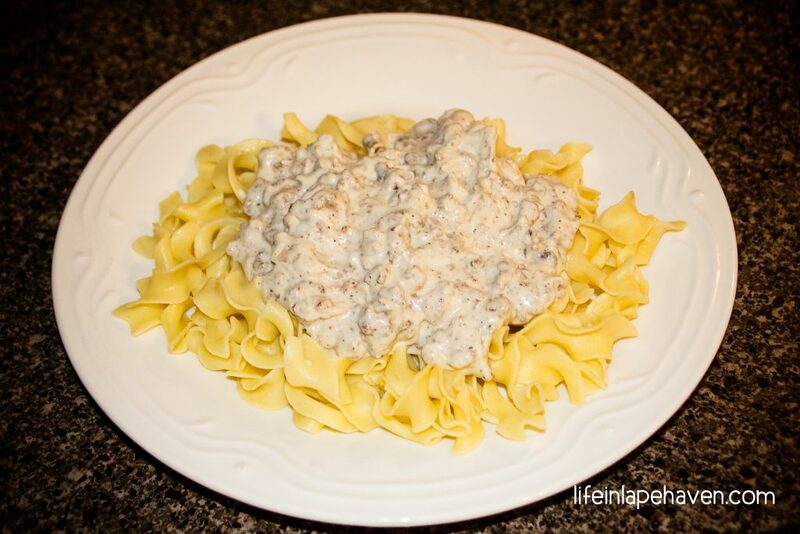 Knowing that my guys all love pasta, I decided to see how they liked Beef Stroganoff, something that I knew my two little boys had never had. It was a bit of a gamble since they can have their picky-eater moments, but it turned out to be worth the risk because everyone loved it. This quick, tasty dish has since become a regular menu item in our house, one that my boys eat right up. The recipe I started with is Creamy Beef Stroganoff from Cooking with K, but of course, as usual, I’ve tweaked it based on what I have on hand and our family’s tastes. 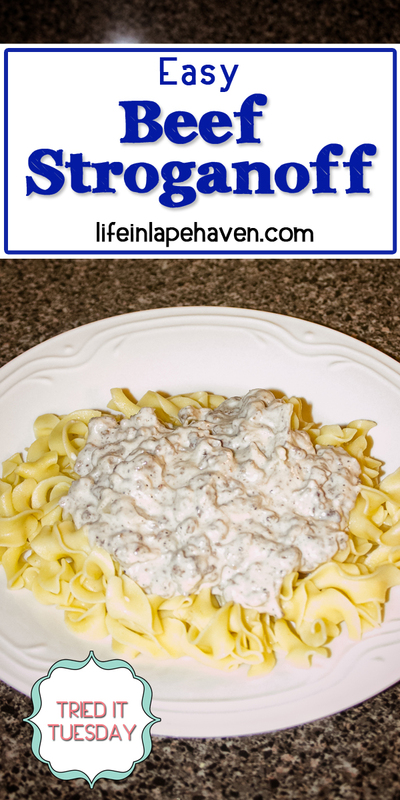 Some of the changes I have made to the recipe include using a little less ground beef and onion, not using any green peppers, adding more evaporated milk, and using Greek yogurt instead of sour cream. It’s also nice to jazz it up with fresh mushrooms or heavy cream instead of evaporated milk. Here’s my version of an Easy Beef Stroganoff. Enjoy! In a large skillet, brown ground beef, seasoned with the salt and pepper, until nearly done. Add onions, cooking until tender. Add soup and milk and stir to combine. Simmer beef mixture for 10-15 minutes, stirring occasionally. Remove from heat and stir in Greek Yogurt. *Note: If making the sauce ahead, freeze it before you add the Greek yogurt (or sour cream). When you are ready to prepare the meal, warm the sauce, then add the Greek yogurt, and serve over some cooked egg noodles. * You could also use fresh mushrooms, sauteed when you are cooking the onions and meat, or use cream instead of evaporated milk. Yum.